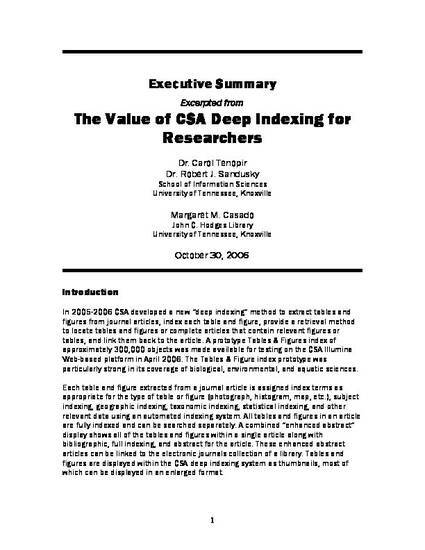 In 2005-2006 CSA developed a new “deep indexing” method to extract tables and figures from journal articles, index each table and figure, provide a retrieval method to locate tables and figures or complete articles that contain relevant figures or tables, and link them back to the article. A prototype Tables & Figures index of approximately 300,000 objects was made available for testing on the CSA Illumina Web-based platform in April 2006. The Tables & Figure index prototype was particularly strong in its coverage of biological, environmental, and aquatic sciences.